and an informal meet and greet. Volunteers are always needed and welcomed. Entry fee is $ 3.00 per cage. Saturday morning before the show. All Entries must remain in show hall until all show divisions are complete and awards are presented. Only emergency exceptions are allowed. Show Awards will be presented at the final judging for each division, with the exception of the AFA Show Awards. Additional Awards include Best Overall, Most Rare, Youngest Exhibitor and Best Lory. AFA Awards will be presented at the Saturday night AFA Banquet Dinner. To qualify for the AFA Show Awards, the exhibitor must be a current member of AFA before the start of the show. The following AFA awards will be presented for each Division. 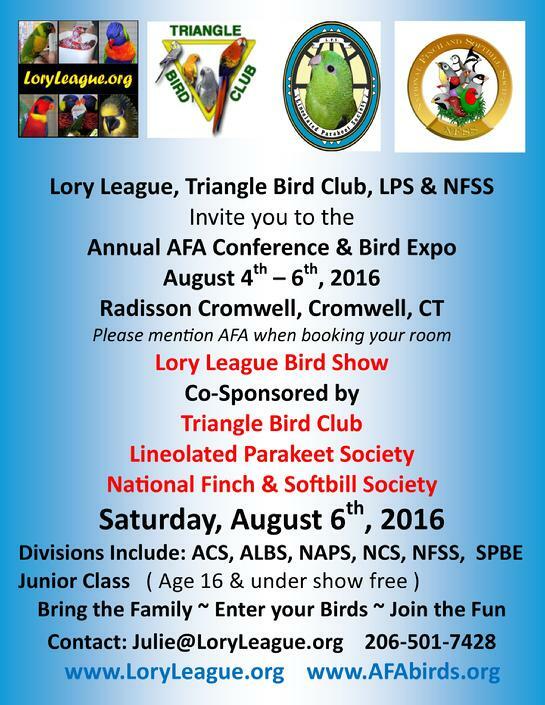 Lory League at the AFA convention. 1. Liability: by entering or attending the shows you agree to hold all organizations or persons, associated with the shows, including the hotel; harmless from any liability in connection with the shows. 2. 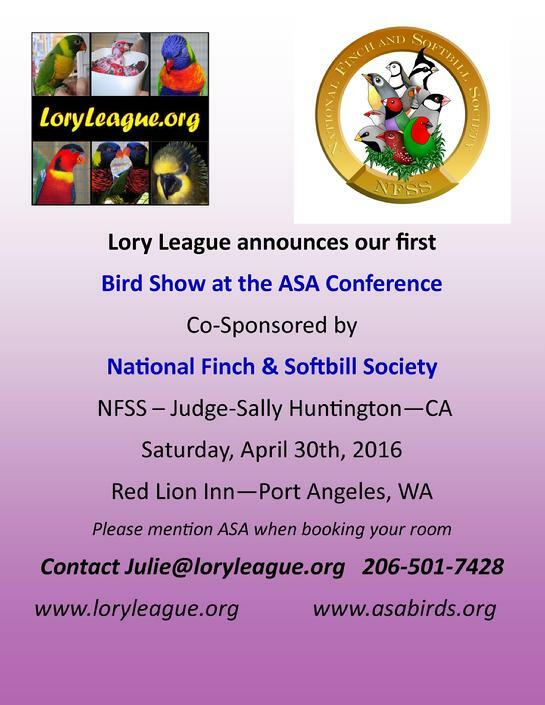 Sanctioned shows: hosted by Lory League and will follow the show club rules and classifications for entries and Judging. 3. Fees: $3.00 per show tag. Junior class is exempt from the $3.00 entry fee. Entry form and show tags are available at Thursday night meeting, Friday night set up, and Saturday morning before the show. All birds must be checked in by 8:00am Saturday morning. Judging will start promptly at 9:00am. Junior class will be judged first. 4. Show Boxes are not required; A flat top cage is recommended. The cage must contain appropriate food & water for the species, one or two perches and no toys or specific markings please. 5. 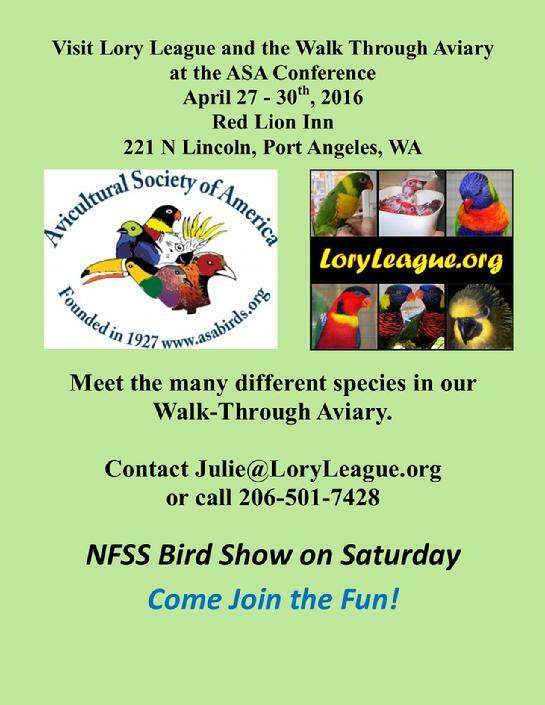 Registration: Complete the Exhibitor Registration forms, and obtain a Show Tag for each bird entered. Show tags are required for each show, and Junior Class. Exhibitors will receive two copies of the Registration Forms. One copy is to be left with entries when staged. The other copy will be needed to reclaim entries after the show. 6. Show Tags: Exhibitors will be responsible for attaching show tags as the birds are checked in, and show personnel will close the show tags once the birds are staged. 7. Judging: The Judge’s decision is final in all aspects of the competition. 8. Reclaiming entries: The exhibitor must retain and present their copy of the registration form to reclaim their birds. All birds are to remain in the show area until after the break, and awards and photographs are completed. 9. Membership rules: Exhibitors do not have to be a member of AFA, Lory League, or any other club to exhibit in these shows. 10. Show Manager’s decisions are final in all matters of show operations, including but not limited to: registration, eligibility, and deportment. The Show Manager may take appropriate action, including disqualification and removal from the premises.